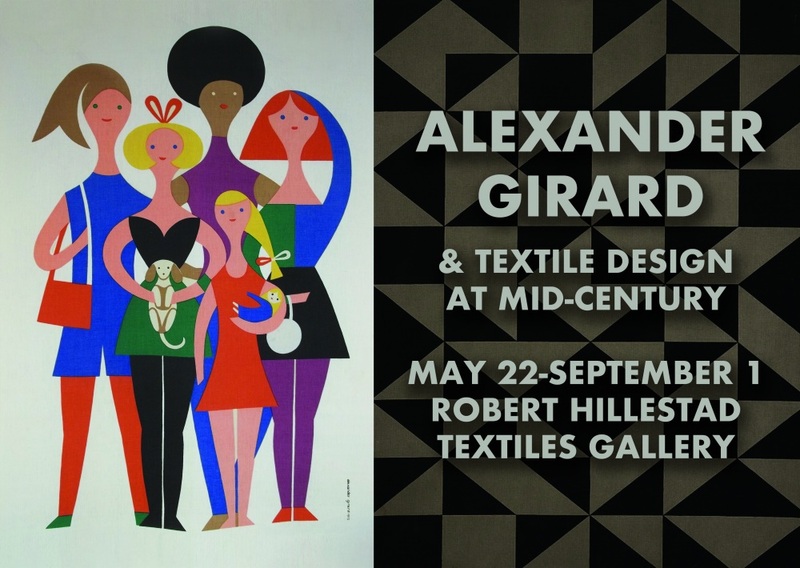 The exhibition “Alexander Girard and Textile Design at Mid-Century” opens in the Robert Hillestad Gallery on May 22, 2017 and continues through September 1. 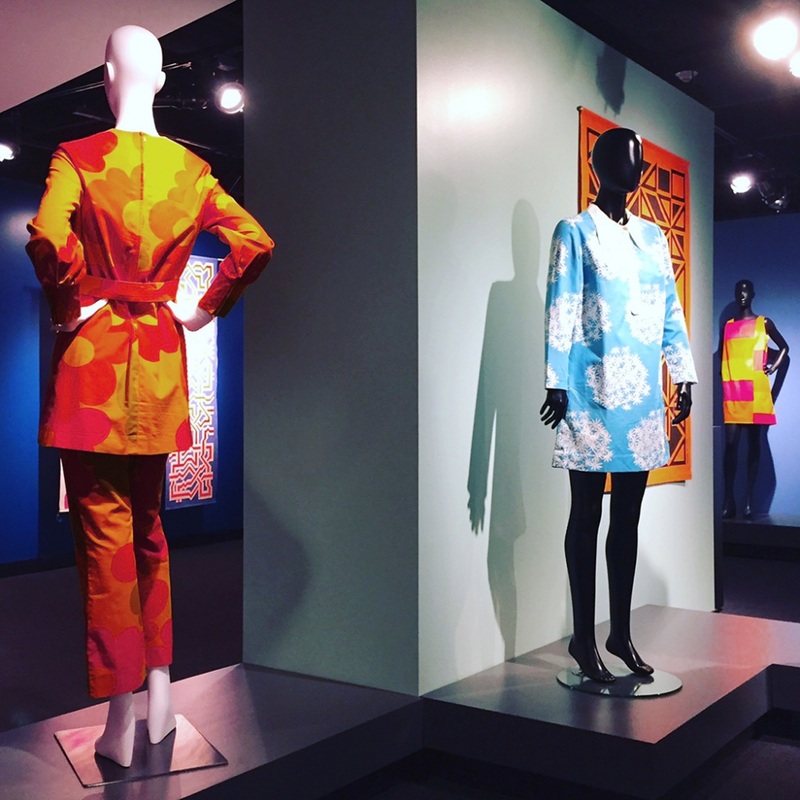 The exhibition features Girard’s designs from the department’s historic textiles collection alongside fashion of the period, to examine how trends in textile pattern, color and fiber were connected across multiple design fields and served as expressions of modernity. Textile design in the Postwar era was eclectic and robust, buoyed by rapid economic growth, technological advances, and optimistic consumers. Alexander Girard was an architect, designer and head of the textile division at Herman Miller Furniture from 1952 to 1973. His ‘new’ applications of pattern and color in textile design supported the postwar consumers’ motivation to demonstrate both ‘good’ taste and modernity in dress and décor. The Herman Miller Company and its close competitor Knoll Associates used various mechanisms, including showrooms, exhibitions, magazine editorials and features, to educate an informed consumer able to make correct choices . Girard’s textile designs, his homes in Grosse Pointe, Michigan and Santa Fe, New Mexico, and his extensive collection of folk art were often the focus of these marketing outputs. As a result, Girard, in company with other design luminaries such as Charles Eames, George Nelson, and Eero Saarenin, became part of the discourse surrounding the skillful expression of modernity through one’s living and work spaces. Girard, unsurprisingly, brought “an architectural approach” to his textiles, preferring the use of stylized patterns, geometric shapes and stripes and lines in bold and unique color combinations. He believed that “realism in printed fabrics should be avoided, [since] draped fabrics naturally distort any pattern.” This statement reflects Girard’s accurate sense of the Zeitgeist of the era in which printed fabric for the ‘modern’ interior emphasized the proper interaction of both the functional and decorative aspects of design. In addition, he and his contemporaries believed that textile design (in fact, all designed products) should effectively support the “necessity for freedom of the individual family…to express its personality.” In other words, textile choices were of the utmost importance in communicating and displaying a modern and individual identity. 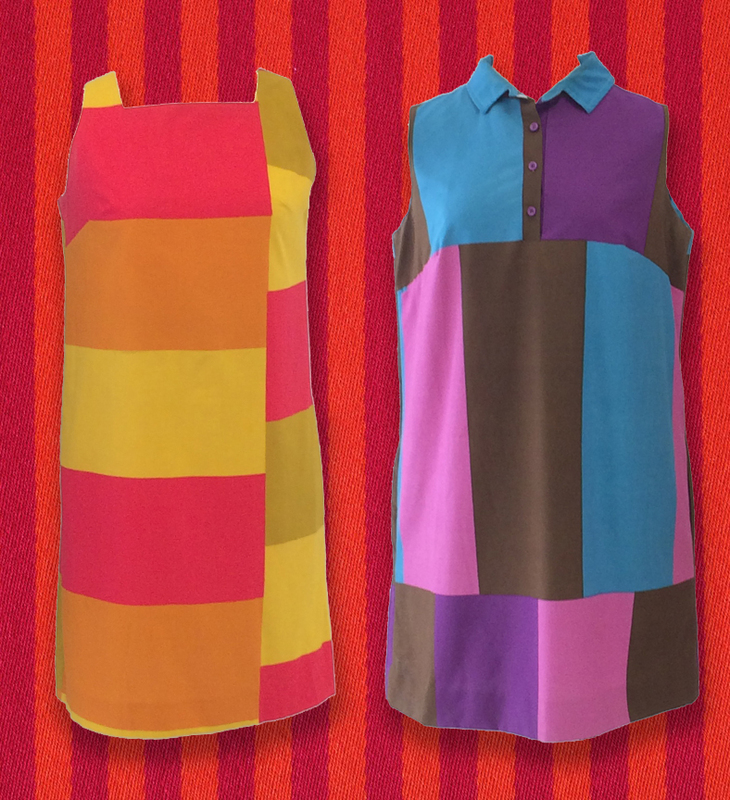 Textiles designed for apparel were also an expression of modernity in this period. In fact, the association of modernity and ‘good’ taste with the new textile patterns and fibers was a consistent feature in fashion magazines throughout the Postwar era. 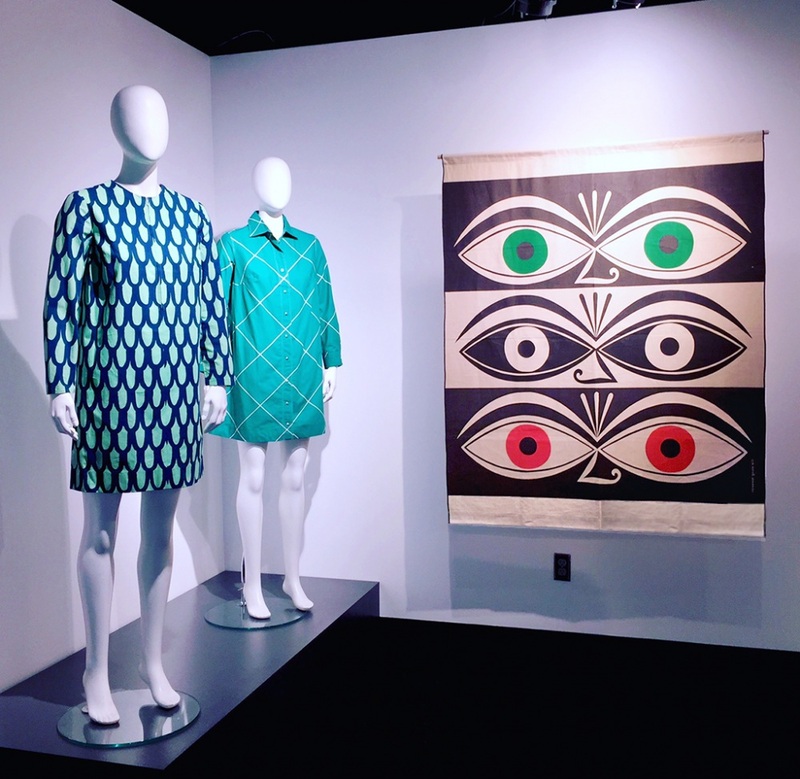 These ‘modern’ patterns and colors for apparel demonstrate the same emphasis on stylized and geometric shapes and bold color combinations found in Girard’s work. In fact, fashion and interior textiles were sometimes featured together in advertising and promotional materials. A half century later, the allure of simple geometries and dynamic color accents continues to influence American culture and personal design sensibilities. The popularity of AMC’s award winning series Madmen attests to the enduring interest in the visual style of the era, and the sophistication and sleek elegance that the ethos of designers like Alexander Girard contributed to. 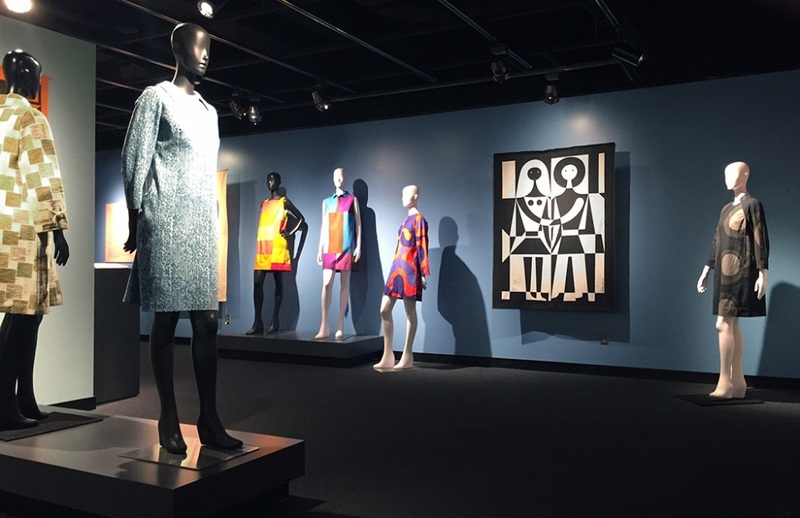 The Robert Hillestad Textiles Gallery hosts a diverse array of exhibitions throughout the year, including shows of graduate and undergraduate student work and exhibitions drawn from the department’s historic costume and historic textiles collections, numbering over 5000 objects. The gallery is located on the second floor of the Home Economics Building on east campus, on N. 35th Street, part of the East Campus Loop (map at http://go.unl.edu/j5v). Hours are 8:30 a.m. to 4:00 p.m. Monday-Friday and by appointment. Admission is always free. Visitors may park in available visitor slots near the Home Economics building or in metered stalls located in the Nebraska East Union lot. For additional information, go to the gallery’s website at http://textilegallery.unl.edu. Lesley Jackson, 20th Century Pattern Design: Textile and Wallpaper Pioneers (New York: Princeton Architectural Press, 2011), 95-96; 109; 114-115. Margaret Maile Petty, “Attitudes Towards Modern Living: The Mid-century Showrooms of Herman Miller and Knoll Associates,” Journal of Design History 29 (2016): 180-199. Ruth Wagner, “Style is Geometric,” The Washington Post, August 30, 1963, C2. Eleanor Kluck and Henry Kluck, “The Printed Fabric,” Everyday Art Quarterly, Summer 1949, 6-10. Leslie Pina, Alexander Girard Designs for Herman Miller, (Atglen, Pennslyvania: A Schiffer Design Book, 2002), 142-143. "Girls" and "Geometric C," screenprints by Alexander Girard. 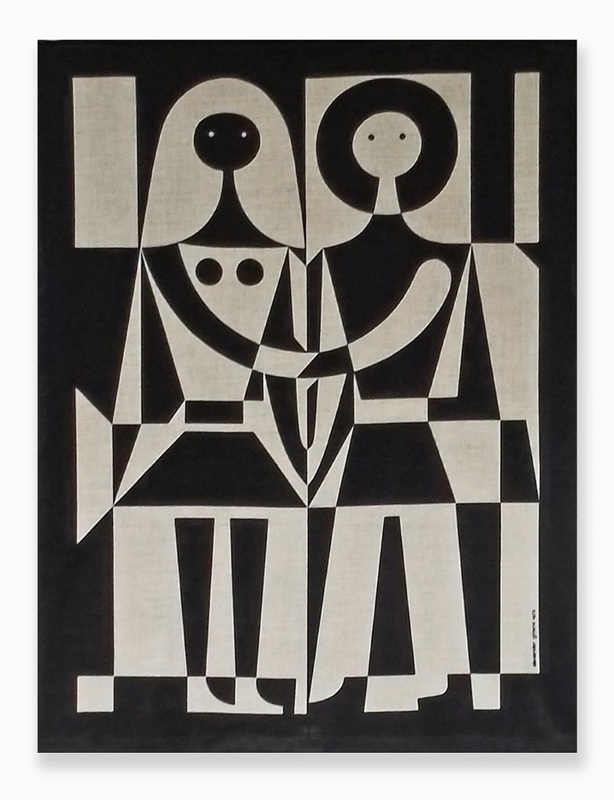 Alexander Girard wall hanging, black and white couple, 1972; screen print on linen. TMFD Historic Textiles Collection. Background: Tootstripe by Alexander Girard, wool, 1965. Foreground: Two shifts by the Swedish label Almedahl, ca. 1965. TMFD Historic Collection.